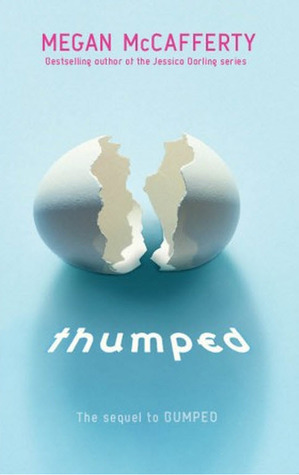 I read Bumped after purchasing it during the awesome $0.99 e-book sale HarperTeen did over the holiday season, and I was so excited to get a review copy of Thumped so I could see how this story ends! I found myself racing through this book because I needed to know what was going to happen next. The chapters are short, so this book is a fast read. I also loved seeing how the relationships between Harmony/Jondoe and Melody/Zen were developed in this book. I love the world Megan McCafferty created in these books; it's so unique and original. The thing that stands out to me the most is that while these are dystopian books, the whole story has a light, fun feel to it -- it never gets too heavy, but still evokes emotion during the intense moments. I love the characters she created with Harmony and Melody. Even though they're identical twins, they are so different from each other, and their separate voices come across on the page. While this book is light and fun, I like how it also talks about a serious subject (teen pregnancy) and doesn't make light of it. Teens in these books have to deal with a lot, and the weight of the decisions they have to make is discussed in a thorough matter. The book also never gets preachy, which I love! It's about teens making their own decisions about intense situations, and I enjoyed seeing how Melody and Harmony's views were formed in both Bumped and Thumped. Thumped was a great sequel that you should definitely make sure to read if you're a fan of Bumped. If you haven't read Bumped, I advise checking it out, so you're ready for Thumped when it comes out!